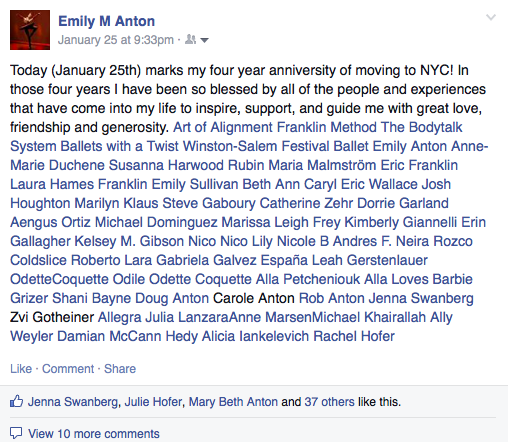 Last Sunday marked the four year anniversary of the day I moved to New York City. The day I arrived at LaGuardia airport with two suitcases and a backpack. The day I hopped into a cab and gave the cabbie an address. I will always remember two moments of that night. One…. When I walked out of LaGuardia airport’s baggage claim into the fresh, cold New York City night air. Two…. When I got out of the cab on 54th street to the snow-covered ground, rang the bell of the residence hall and could barely handle all of my rolling bags to get inside and out of the snow. What have I done?!!?!? Why have I done this?!?!?! What do I do?!?!??? Can I possibly do this??!?!?”. Besides, in those moments, what other choice did I have? Before leaving the west coast, I had made arrangements to stay at this catholic residence hall for three whole weeks. At the time I had made the reservation, three weeks seemed like forever, but it wasn’t. Yet, it was perfect, because I never had to sleep the night on the street despite the fact I didn’t get an apartment until April, hardly had any money, only knew a few people in New York City and didn’t get a job until March! Then last week the lyrics came back into my head and I thought, “wow, those are actually quite good” and then I watched the music video. I saw Taylor Swift and several casts of backup dancers dancing. They were dancing ballet in white tutus as is traditional for ballet, they were dancing contemporary dance in neutral, beautiful colors as is traditional for contemporary dance, they were dancing hip hop in pop large, loose fitting clothes as is traditional for hip hop dancing…. It is an awesome music video, especially when viewed as a dancer. I was completely and pleasantly surprised. Then this week I read the full lyrics written out. They are beautiful and awesome lyrics and they really resonated with me! A lot has happened in my life these past four years I have spent in New York City. Heartbreak…… Pain, physical, emotional, spiritual…. Joy……. Love….. Excitement….. Happiness…… Purpose…… Work, lots and lots of work…..
My calling to moved to New York City originated with dance. And it is dance that I find every day. In all the pain. In all the heartbreak. In all the joy. In all the happiness. In the rain. And in the sun. I continue to come back to dance, each and every single day. I have come to believe that it is dance which carries me through it all. Dance which nourishes my soul. Dance is my purpose on this Earth. I am blessed to have figured this truth out at a young age, taken the great leaps of faith which have led me to having a professional career in dance and have a body which supports me in my goal. Although I feel like there are no accidents and I sense that my supportive body and presence and confidence to leap are all a part of the fact that dance is my purpose on this Earth. I believe there is a God, a Creator, a Universal Love, Grace, and Consciousness which is loving, kind and full of mercy and support. I believe that there is a master plan and we need to be willing to listen, hear and take the steps on our unique path. We must be actively engaged in our lives. We must be willing to do what scares us the most and leap off a cliff every now and again, completely confident that we will be caught and held in the loving and tender hands of our God. I have to believe because I see and have felt so much good, so much love, so much grace, but also because I have felt pain, heartbreak and uncertainty. Yes, and though it all I have had dance and I still have dance. I will have dance for the rest of my life. And furthermore I have ME and my desire to be the truest version of myself.